Let water, milk and 50g of butter boil togheter with a princh of salt. Add 80g of cornmeal and cook while constantly stiring for 5 minutes. Tear the cheese in flakes, add cream, a princh of pepper and let it melt slowly on medium fire. Put polenta and fondue on the dish and pour slowly above the cornmeal and butter in excess after browned them off. 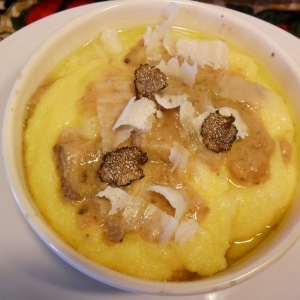 Grate over a bit of truffle and serve as main course.